Newly elected Knesset member Ruth Calderon caused a sensation last year when she engaged a member of the Sephardi religious party Shas in a discussion of Talmud during her inaugural speech in the Knesset. She had brought her copy of the Talmud to the podium and read a short excerpt about Rav Rehumi, who stayed at the yeshivah to study on Yom Kipper eve. He fell to his death at the moment that his wife realized he was not coming home. Calderon read the cryptic tale first in Aramaic “for the music” and then in Hebrew. The story is one of 17 included in A Bride for One Night, an English translation (by Ilana Kurshan) published earlier this year by the Jewish Public Society. The book was originally published in Hebrew, in 2001. Although the talmudic tale focuses on Rav Rehumi, Calderon in the book re-imagines the event from the perspective of his unnamed wife. The vivid first-person account portrays the wife’s challenging life, from her joy in marriage to her anxiety as she waits. The commentary, with footnotes, offers some observations about the Rav’s emotional life, romance and morals. Calderon also provides sources for further readings. In the lingo of these modern times, this book is a “disruptor.” Calderon has flung open the doors to the study halls. She has liberated the ancient texts, taken them out of the exclusive preserve of religious male scholars and made them accessible to anyone who is interested in learning about how to be a good human being. A mortal steals the knife of the Angel of Death, God asks to be blessed by a human being, the wife of a Torah scholar dresses up as a prostitute and seduces her husband, a rabbi sets a test for his wife that leads to her suicide. Legend, creative literature, relationship advice, folk sayings, guideposts for a moral life – Calderon turns the kaleidoscope just a little bit and the ancient Talmud becomes a text for modern times. 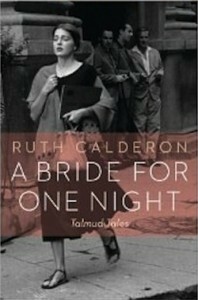 The title of the book, A Bride for One Night, comes from a text in the Babylonia Talmud. In two different passages, highly respected itinerant rabbis ask, Who will be mine for a day? The question is associated with a woman selected by the community as a “wife” for the duration of the rabbi’s stay. Calderon imagines these situations from the perspective of a widow who has been asked to be a bride for one night. After considering several possible ways to understand the tale, she concludes that the concept of marriage for a day is intended as a test of Western conventions about love. Calderon approaches the sacred text with the belief that the contemporary Jewish bookshelf should include the Talmud, Midrash, kabbalist works and other religious texts, as well as Jewish literature and Torah. The Talmud and other sacred texts are the common denominators of all the Jews of the world, she said recently during an address to graduates of Hebrew College in Boston. More than half of the Jews in the world are secular. Calderon was raised in a secular family and neither her school nor the local library had a copy of the Talmud. She had to search for copies of sacred texts. She began to study Talmud after her army service. “This is something that belongs to me, is part of me and I had to reclaim it,” she told the graduates. Long before she entered politics, Calderon was involved in studying Talmud and bringing sacred Jewish texts to all Jews, regardless of religious affiliations or their level of learning. She founded Elul in Jerusalem, Israel’s first “secular yeshivah” for men and women, religious and non-religious. She also started Alma, a Home for Hebrew Culture, in Tel Aviv. For many years, she studied daf yomi, a daily page of the Talmud, with a chavruta, a study partner. She has a doctorate in talmudic literature from Hebrew University. With this book, Calderon challenges the reader to imagine the life and inner thoughts of religious leaders, to see beyond the text on the page and flesh out all those mentioned in the tale. She takes ancient theology, often with outdated and distasteful concepts, and reinterprets them for the modern age. Similar to Talmud, her book is best read with a study partner. She has said during the U.S. promotional tour for the book that the imaginative tales reflect what she was thinking at the time she wrote them, and that she might offer an entirely different point of view if she were to become engaged once again in studying those passages. Yes, she is right there. A Bride for One Night is just the beginning of the discussion. Media consultant Robert Matas, a former Globe and Mail journalist, still reads books. A Bride for One Night is available at the Isaac Waldman Jewish Public Library. To reserve it, or any other book, call 604-257-5181 or email [email protected]jccgv.bc.ca. To view the catalogue, visit jccgv.com and click on Isaac Waldman Library.